Pocket sprung or memory foam? Mattresses that are very firm may have between 3000 and 3500 springs and these are generally meant for orthopaedic purposes. 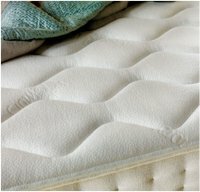 In the conventional open coil system employed in many mattresses, you may find that the way the springs are linked leads to springs at the far end of the mattress moving when pressure is applied on the near end springs. This results in an awkward bouncing feeling each time your partner moves - and that can be pretty disconcerting. Since the newer types of mattresses have become more affordable to everyone, its a good idea to review the latest developments and the benefits they may bring. That is where the pocket sprung mattress is useful. The technology used in this type of mattress ensures that the individual springs on the mattress follow the natural curves of the person’s body, thereby enabling adequate support and comfort. None of the springs are linked and there is no roll-together or rebound feeling. Thus, as compared to the conventional spring mechanism where springs are interwoven, pocket springs are independently placed and have the luxury of better freedom. As you move, the springs move with you and only those in contact with the body are impacted, leaving others by themselves. Tests have proven that pocket sprung mattresses reduce body strain as compared to conventional mattresses, as they adhere to the shape of the body. The natural alignment of the spine is not compromised and body weight is evenly distributed. The various support zones provided in the mattress ensure that relevant body portions are accorded the right support, with special emphasis on the spine and lower lumbar region. 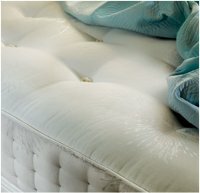 The next development in mattress technology is memory foam, or latex. The advantage with memory foam material is that when pressure is applied, the cells of the foam distribute air pressure quickly and will therefore not come back to its original position in a hurry. This leads to better comfort when you lie down on such mattresses as the pressure on body pressure points is reduced. The second benefit is the total lack of rebound when your partner moves, much like the pocket sprung mattress, you might not even be able to tell that there is somebody else in the bed. Do check out the pocket sprung mattress at a store near you and while you are at it, you may also test a memory foam mattress as well to find out which is more comfortable. Best time to buy a mattress.